The free event timeline template was designed to give planners, their teams and their partners the ability to see what items need attention before they are due. 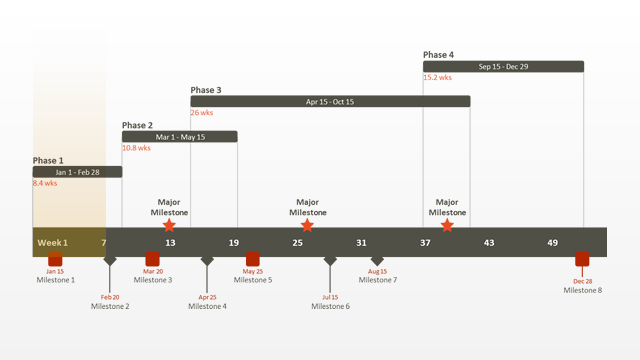 It has been created to be a simple event planning timeline that illustrates all the major deadlines on a single summary slide. The template should be a useful resource for planners who are managing teams and vendors. Organizing an event requires meticulous planning and a disciplined focus on details. Often, that planning can get lost amongst complicated documents that are difficult to read. Staying on top of the plan by meeting milestones well ahead of their deadlines is key to the success of an event planning business. 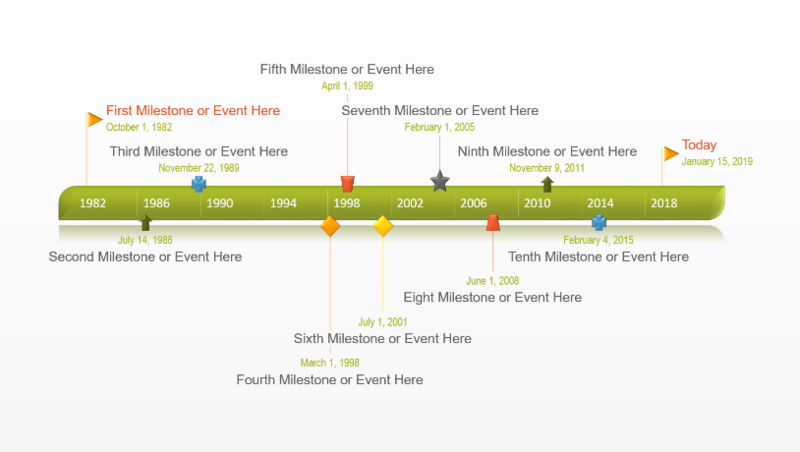 The event template creates a timeline visual that is easy to read and understand. Visually presenting the major milestones on an event planning timeline clearly communicates what needs to be done and by when, in order to meet the plan's goals. 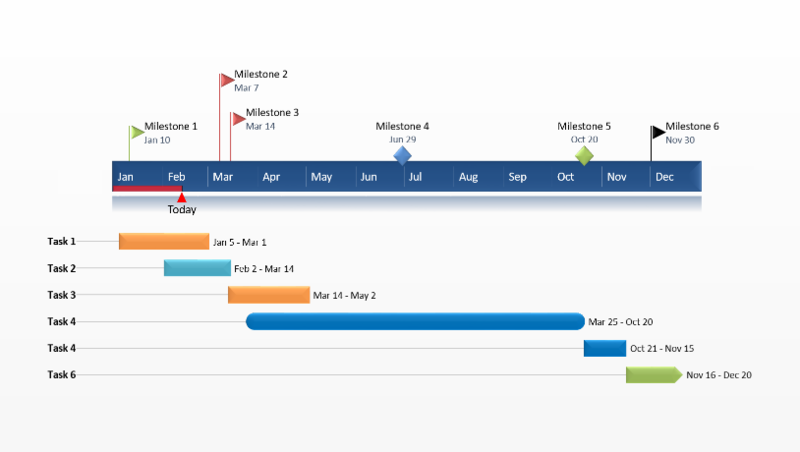 An event Gantt chart or timeline that is easily accessible and easily shared also means planners, organizers and contributors will never lose sight of pending milestones. 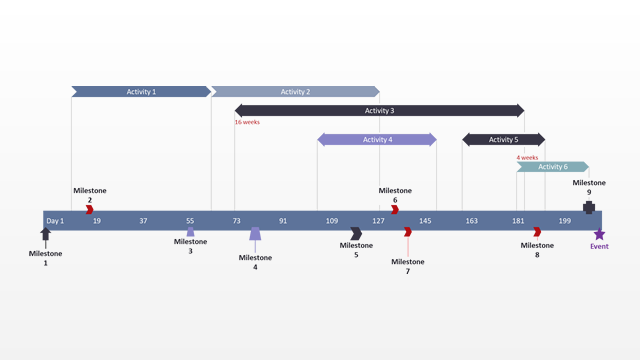 The free event timeline template was created in PowerPoint to communicate event plans on a slide in a professional way. PowerPoint makes impressive visuals, but it is also a familiar tool that can be easily accessed by anyone working on a timeline or Gantt chart for event planning. Suppliers, vendors and other team members can easily collaborate or update the plan as milestones change or as deliverables are completed. The event planning timeline template can be manually edited in PowerPoint or automatically with the free Office Timeline plug-in for PowerPoint. 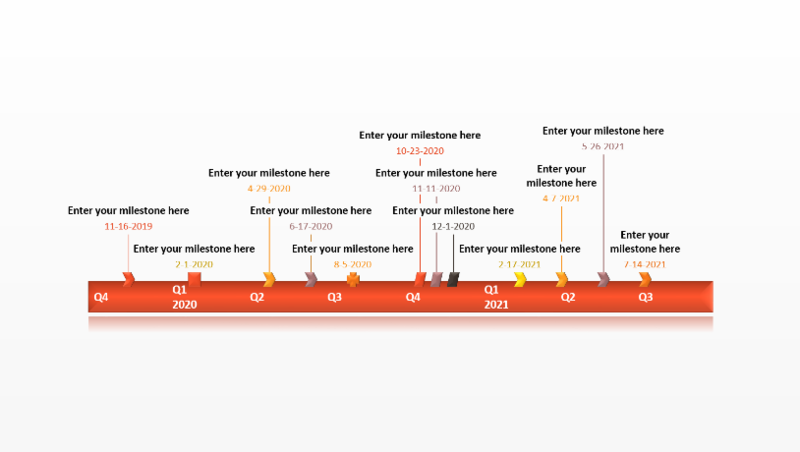 Office Timeline will instantly update the template’s placeholders with your specific event plan. The free plug-in also enables quick revisions, so your event Gantt chat or timeline can be reused, updated and changed as fast as your plan changes.